When completely cool, run a metal spatula or knife around the sides of the pan to loosen the cake and then remove the cake from the pan. Next, run a metal spatula or knife along the bottom and center core of the pan and remove. Place on your serving plate. It is best to cut this cake with a serrated knife using a back-and-forth sawing motion. 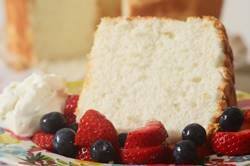 Try not to press down on the cake when cutting as this will squash its soft and spongy texture. This cake is best served on the day it is made but it will keep covered for a few days at room temperature or for several days in the refrigerator. It is great toasted.